My friend was recently in Carmel and almost went to a Laurie Anderson concert, but she was too tired from the conference and chose to stay in. I’ve always enjoyed the wacky and esoteric lyrics of Laurie Anderson. They have a sneaky way of making you think about regular stuff in new ways, for example, that “Language is a Virus,” which is a pretty cool idea to ponder. William S. Burroughs had introduced the concept of language as a virus much earlier, in 1962, only he insisted that language was here to control us from outer space, which may have some truth behind it if you really dig deep into the idea. The viral qualities of language are also very similar to the concept of memetics where cultural information is transmitted like a virus among people using memes, the basic building blocks of culture. It makes sense that language by it’s nature infects us because most words and phrases in language are linked to the concept they represent. This topic of language is at the front of my brain because I’m taking a Spanish class while we’re in Asheville. I always regretted choosing French over Spanish back in High School. I was living in California and Spanish would have been the better choice, but I chose French because my dad said it sounded classier. In his defense it was the 1980’s and the influence of French food on California cuisine was pretty strong. But French has been sort of useless and I didn’t even use it when I was in France. I couldn’t even order water, “l’eau”. l would try to pronounce all the syllables and it came out “leee-owww-uuu” instead of “lo”. So I just ordered Perrier. Agua is much easier to say. They say it’s really difficult to learn a language as you get older and I agree. However, I do have the luxury of fewer distractions in my life on the road, so now is a really great time to take advantage of this time. But I’ve never been great at studying and memorizing so it’s not exactly easy. But I don’t want to give up so quickly so I decided to do a little research and try to understand how people learn a language. The first step is to figure out your learning style, or simply whether you learn best through seeing, hearing or touching. Visual learners need to see something in order to learn it. They learn best taking notes on overhead slides and reading diagrams. They tend to be well organized and do best studying alone. Auditory leaners need to hear information and are good at understanding subtle changes in tone in someone’s voice. They do best studying in groups where they can hear the information read out loud. Tactile learners do well by moving at the same time they are trying to learn something. So doodling or studying while on the elliptical are good ways to lock in knowledge of new material. After taking a bunch of quizzes on the internet, I found out I am a tactile learner. I got a couple of language apps and started studying in short sessions several times a day. I made up some flash cards in my phone. I study in the car (not while driving), on the couch, at the pub. Last night, I listened to Julio Iglesias and I now know all the conjugations of “to want”. I also tried watching a Mexican comedian with subtitles, but he wasn’t funny. Today, I’m going to try El Yoga en Éspanol on youtube. It’s total immersion, and it’s starting to sink in, kind of like a virus. Most people don’t really understand how viruses work. Viruses are actually super small particles that are just a much simpler version of a living cell. Basically, living cells have a nucleus or semblance of a nucleus that acts like a chef and tells the cell what to do. 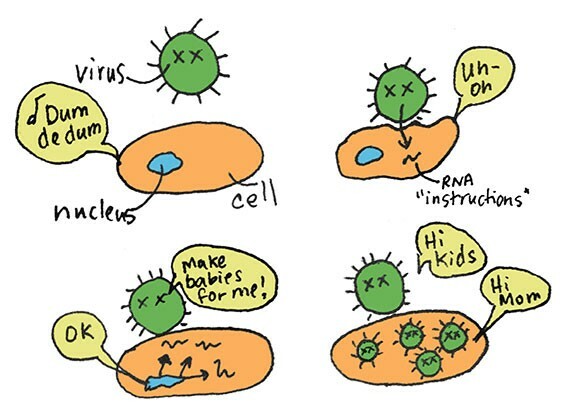 Viruses have nucleic acid which is kind of like a recipe. Because they are not technically alive, viruses can’t replicate on their own. They need a host, and they can be quite persuasive when they want to spread their viral agenda. Viruses can trick living cells into letting them in because they have proteins that seem like proteins in other living cells. Once through the door with their skeleton key, viruses tell the cell, “make more of me.” Hijacked and tricked by the devious virus, the cell turns into a factory for new virus particles. In some cases, it doesn’t even know it’s happening. Sometimes, viruses break in to a living cell and just “hang out” for a while waiting for the right moment. HIV does this. Obviously, there’s a lot more complexity, but I find it fascinating that something could be just hanging out inside your cells just waiting for the right moment to bring the cell under it’s control. Like language, it’s right there under our noses. The subversiveness of language becomes very clear when you start learning differences between languages. For example the slang word “moola” sounds a lot like “mula” in Spanish which means “drug mule”. Seems fairly appropriate. Also, in romance languages like Spanish, nouns are either masculine or feminine. Most of them make sense. Like milk, “la leche”, is feminine, but the word for egg, “el huevo” is masculine. Besides a sea horse, what male animal ever laid an egg? Another good one is the word for night, “la noche,” which is feminine. I guess this could be either good or bad depending on how you interpret it. 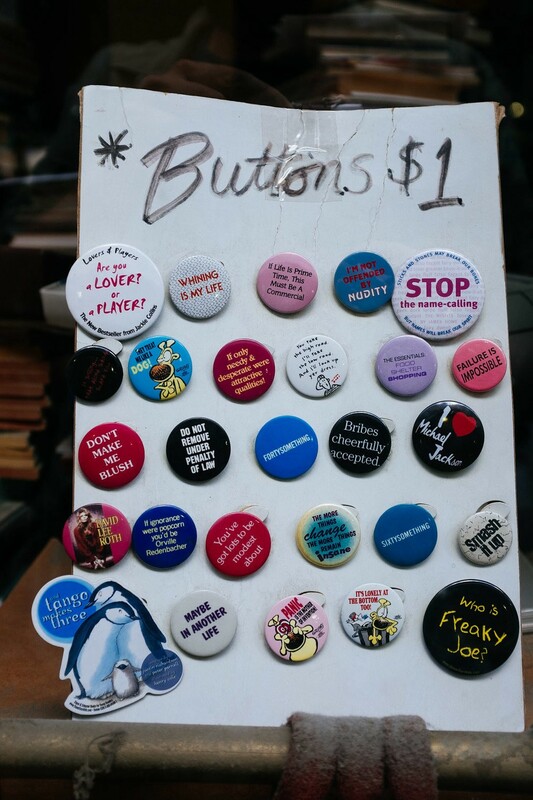 Like a virus, language can infect us by implying poetic connections between words and sometimes by implying alternate meanings. Add a few sexual undertones and you’ve got quite a few tools for mental manipulation with human beings as the host animal. But we can absorb all of these intricacies and maybe even use language to expand our minds. We can possibly end up more compassionate. We can enjoy the poetry of these ironic juxtapositions of different concepts despite these viral menaces knocking at our back door. Like “papá”, the Spanish word for dad, is one accent away from “papa” the word for potato. Very cute. We know that language is much more than just how we get our point across. It is ripe with layers of meaning. It is simultaneously overt and subliminal. It uses trickery to replicate itself. Like a virus, language is not simply the ability to communicate, but the ability to infect. The magic then, comes from how it’s interpreted.